Only One Trip To Offer At The Moment.. Sailing for Sea Bass Saturday, December 21st — Last Of The 20 Fish Limit I Fear — Depart 5:30 Return 4:30 — $150.00 — 18 Anglers Sells Out — Expect A Long Ride..
8,100 "Oyster Castle" reef blocks by the rail – 2,414 at Jimmy's Reef – 1,468 at Ake's – 288 at Lindsey Power's Isle of Wight Reef..
My @mediacombb address will soon be a memory. Please use mhawkins@siteone.net for correspondence..
NOAA forecast has this Saturday's winds downgraded to SW at 10 to 15. Have to try with that forecast. If you book the trip don't turn your phone off..
Appears as though Christmas day will be the first true calm. Went hunting once on Christmas day some-three decades ago. Soon found "Get Out Of The Doghouse" coupons did not apply. Jewelry, Flowers: Nothing Worked. Lesson learned. Not going fishing Christmas day. Want to fish. Will be watching the weather. Will try again & again. Did sneak in our last super-short notice tog trip. These trips during closed season are for age sampling; the fishing done with a federal scientific collection permit. Biologists weigh & measure the tautog, then remove the gill-plate (operculum) & otolith or "ear bone" for comparative aging analysis. Its a big deal for many of the fisheries scientists working behind the scenes. Trading samples between states helps refine their accuracy. Where on the previous trip we tried hard to catch a good crowd of great anglers even dinner, it was not to be. Didn't even have 20 fish on the boat, and that with no size limit..
Poor performance recently past and VERY short notice announcing a Friday the 13th trip; I only had one client sign up. Some of my, ah, 'more experienced' clients will well-remember Dragnet's, Sgt. Joe Friday announce each week: "The story you are about to watch is true. Only the names have been changed to protect the innocent"
So: Four biologists, mate Mike & I, and one client – I'll call him "Henry" (to protect the innocent) - left the dock at about 6AM with a load of green crabs in the name of science. No size limit, no creel limit — Bad Old Days Revisited. "Henry" had 30 in his cooler just after lunch and took a nap. It happened that I had one of the East Coast's most respected stock assessment biologists aboard. At one point he and I were pondering the truth of tautog management deeply & without hooking a fish while "Henry" caught at least 10 fish right next to us. The incident drove home 'skill' as an often-necessary component of tautog extraction. I was able to touch on habit & habitat fidelity a bit when I explained, "While fish at this spot are just about capped at size limit; if we found another wreck half-a-mile away that had never been fished, it would be loaded with large tog." That's why we skippers are always looking for new hangs – pieces. You can experience "Fishing Like The Good Old Days" -if only for a short while- when you find a new wreck. For now we still have no population ecology factored into Mid-Atlantic fisheries restoration. Day may come. Sure won't happen with catch-restriction only based management. The much-touted repair & replacement of MuRFSS's recreational catch estimates with MRIP has failed. Catch estimates used to drive today's regulation are still so full of misrepresentations that a true picture of restoration's need is difficult to discern. While a terrestrial biologist might well consider trees to restore a population of squirrels; fishery biologists in the Mid-Atlantic have yet to ponder our reef-fishes' habitat needs. Coming to it I think. Its become an annual battle: MRIP has party/charter operators & clients fishing very lightly and far, far below historical averages as continuously tightening regulation would factually have. Professionals do, after all, send in daily catch reports - Vessel Trip Reports or VTRs. That's why I think the for–hire recreational catch estimates are on much firmer footing, much more accurate, than private boat estimates - because of VTRs. According to MRIP catch estimates, it's those wicked savages aboard private boats that can not be reigned in. They PUMMEL sea bass every possible chance—even when for-hire skippers cannot scratch up a catch: The tighter regulations get, THE MORE SEA BASS PRIVATE BOATS CATCH. Yeah, um, about that.. illusion. It was in 2004 when private boats were first "shown" by catch estimate to broadly out-catch the for-hire fleet when it came to sea bass. Prior to that party/charter were always the wicked over-fishing barbarians — Always. Prior to 2004 the For-Hire fleet ALWAYS had significantly higher sea bass landings in the Mid-Atlantic. Pretty sure we still do. Except not in the estimates. I'm hopeful the letters being sent by readers will pique the curiosity of NOAA's new boss. I don't know Dr. Sullivan personally, but the fighter pilots I've known who would strap a rocket to their backside and ride it weren't tolerant of bad anything. This lady's ridden bigger rockets, a lot bigger. Been in orbit three times. Was the first woman to walk in space. Hope she sees this data for what it is and calls it like she sees it. Below I've included the snail mail I sent her & two emails I sent more broadly across the top of Mid-Atlantic fisheries. I urge all who seek fairness in our fisheries to write as well. Funny, at the December Council meeting you could feel the tension when they were discussing Wave 1 (January/Feb) sea bass landings. Very nearly a party/charter only fishery, NOAA expressed deep concern about high levels of catch during a time when they have no 'official estimate' - just Vessel Trip Reports, the VTRs we send in for each trip. While it won't be open this year, members of the MAFMC did vote to open Jan/Feb in 2015. Seeing fear of the unknown as a real issue, I and several others made a sincere & diligent effort to create an accurate estimate of wave one, 2013, sea bass landings. We completed the effort on March 4th, 2013. Although there were a few private boat trips out of Virginia, virtually all the rest of the Mid's private recreational boats were under tarps for winter. Calculating every single angler as over-limit, I sincerely believe last January & February for-hire fishers caught less than 133,000 pounds of sea bass. Our Mid-Atlantic quota is 2,260,000 pounds..
At that recent December meeting I thanked Council for their concern over winter sea bass but wondered aloud about their lack of incredulity concerning the half-million-plus pounds of summer cbass catch by NY private boats when for-hire was thought to have caught just 25-thousand pounds..
Time after time these last few years I have asked others in my trade, "What percentages of sea bass are caught in your region by for-hire & private boat." Up north they seem to think it may run to half – maybe. Down here, off MD's coast, I doubt private boats have ever caught 10%..
We're talking about sea bass, not flounder/fluke..
That summer 2013 NY estimate has the private boats catching twenty-one sea bass to every single one by party/charter, has the recreational NY boats catching fully 25% of the Mid-Atlantic's entire recreational quota. But it was tougher fishing up there this year I'm told..
"..the tougher sea bass fishing is for the for-hire fleet, the private vessel fleet catch craters to bare bycatch…." In other words: When sea bass are really abundant, private boat share increases. But when its tough, their catch declines to a minimum. The easy pieces & wrecks already fished down, its easier and more productive to go fluking. But even when sea bass are abundant for-hire's estimate should represent approximately half of the landings and never-ever just be just one-twentieth.. I've tried, and will continue to try, to get estimators to look for this comparative analysis based on for-hire reports. As architects they are the truest believers in the data they provide; many at the top of fisheries science think it highly ill-considered to use reports fishermen have submitted as any form of data – Fishers Lie. But because scientists & statisticians have not troubled themselves with truthing new estimates, our fisheries & businesses die. More precisely, it's because management has not found a WORKING SOLUTION on how to use the catch estimates' full & correct answer, including PSE or 'margin of error'..
September & October's catch estimates now in, you can imagine it doesn't bode well for preserving our sea bass season. Probably lose more than the shorter season & smaller bag limit recently voted by Council. I'll nose around in those estimates soon. Meanwhile, Ask Dr. Sullivan, CINC NOAA, if she thinks the repair Congress required of our catch estimates back in 2009 has actually occurred. The new and long-awaited Congressionally ordered repair & replacement of MuRFSS — MRIP's offered plenty of smoke & mirrors in press releases, but no improvement in accuracy. Your sincere efforts to restore black sea bass in the Mid-Atlantic with the "Best Available Science" are again being waylaid by recreational catch estimates that should not & do not qualify as "science." We need to be relieved of the economic hardship these capricious, unpredictable estimates create. We need NOAA to stop taking more & more of our fishery due to estimate's accusations of being over-quota when no such extraction has occurred. This year's candidate (so far) for worst recreational catch estimate: NY's Wave 4 Private Boat/Rental.. I have expert testimony from professionals that sea bassing was tough off NY this summer. Yet MRIP has that state's private boats having their best summer ever – by almost double. It was so good those weekend recreational fishers caught more than the entire east coast's for-hire fleet. Considering many of the private boats lost to Sandy hadn't even been replaced, that's a spectacular catch. Funny too that NY's own for-hire landings were nearly at a decade low – catching just 12K pounds to the private boats' 534K..
We need real science to repair our sea bass fishery. Habitat, Habitat Fidelity & Managing the Stock For Maximum Production found in Population Biology are the sciences we need. Instead, a singular reliance on recreational catch estimates has uncoupled management from fisheries science. Fluffed-up by absurd recreational catches, the true state of our sea bass population is poorly understood. Kafka wrote: "Paths are made by by walking." Recreational regulation's well-worn & familiar paths of greater & greater catch restriction – always due to using the centerpoint of a recreational catch estimate – is eroding the recreational sea bass fishery more swiftly than ever. ..yet the stock is still more diminished. 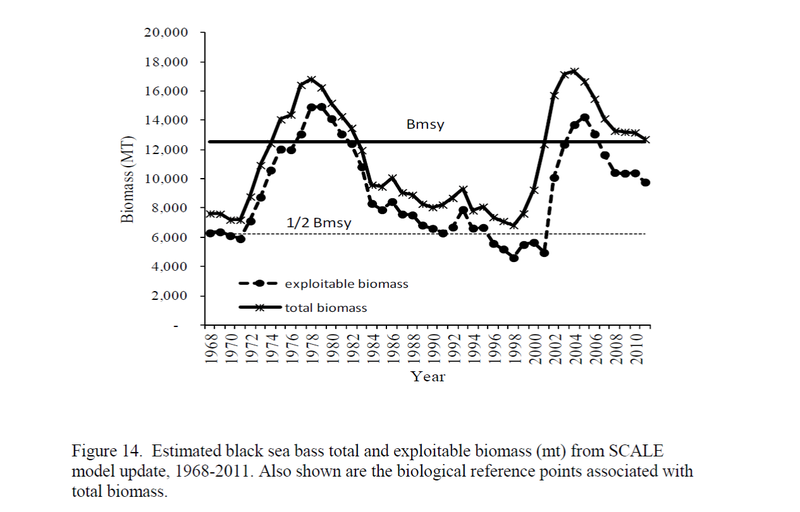 You can see in Dr. Shepherd's biomass graph below how the stock rose straight from the depths of darkest overfishing, real overfishing — You can see how the sea bass population climbed incredibly despite increasing recreational & commercial pressure during the early years of management. Sea bass were so abundant in 2003 that I wrote, "We are now at habitat capacity." Today, I'm afraid, is NOAA's Pogo Moment – "We Have Met The Enemy.."
I've done a lot of work on 'age at maturity' in sea bass. (be glad to send it to you) Was tossing under 9 inch fish back in strictly enforced boat regulation in 1992, six years before management even began. Was all alone in that along the coast & for one reason: A biologist told me, "All sea bass have spawned by 9 inches, some twice." That statement was true until 2001. Production has declined incredibly as age at maturity has shifted from age 1 to age 3. ..which is also when they start spawning. And all NOAA seems able to do is cook up a new batch of horse-feathers showing recreational overfishing & some hogwash about sea bass "moving north." 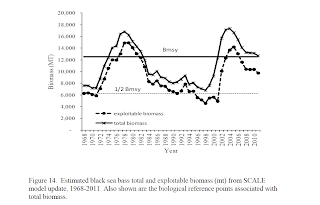 Yes, there is habitat expansion in warming water: However, lacking allopatric speciation, because NOAA is still reporting black sea bass landings along both coasts of Florida, its preposterous to assert the southern MAB's population is 'moving' anywhere. Management does not use habitat fidelity as a tool, nor age at maturity. Our corals & whips remain unrecognized as EFH.. It Needs To Get Fixed. More Bad Estimates & More Catch Restriction Aren't Going To Help Fix Sea Bass. Uncouple the centerpoint of catch estimates from management and let real science get a toe-hold. We need our sea bass back..
Not just the season & bag limit – We need the fish & the clients back too. I assert enormous errors exist in the recreational catch estimate centerpoints & that the new and improved estimating system can be neither while managers use only that single centerpoint number. Because we witness the black sea bass fishery at sea & have contacts everywhere watching fish cleaning stands; Because we see exactly how many boats are fishing our reefs & often know the operators—even on private craft; Because we know what they're fishing for and generally how well they catch: When NOAA asserts NY's private boats caught many, many times what the for-hire fleet caught; When catch estimates confront reality in a wholly unscientific way, When NOAA stands by assertions of "Best Available Science" when the centerpoint of an estimate isn't remotely true: In the eyes of fishing's witnesses NOAA has abandoned honest & sincere science in favor of a regulatory baseball bat. Its very doubtful NY's private boats caught on par with the for-hire fleet. Its far more likely recreational skippers caught less. Yet the estimate's wave 4 centerpoint has private boats catching 21.4 times more sea bass than NY's for-hire skippers..
That one centerpoint estimate becomes a hard number for a substantial portion of the Mid-Atlantic's recreational sea bass quota. Wave 5 estimates have now come out. ..and be no closer to a true path of fishery management. You must be persuaded that rational systems of punishment & reward must be founded upon reasonably accurate estimates. To be punished with further catch restriction when real catch & effort are at incredible all-time lows could only be a result of bad data. Black sea bass are perhaps the simplest marine fish to manage: Building & protecting habitat (even if by accident as in the late 1990s) while forcing them to spawn young has already proven to create astronomical stock growth. Incorporating a lighter touch of catch restriction while mindful of the species affinity for short winter migration with a return to the exact same spawning reef would allow an even greater population expansion: By regulating the prevention of over-harvest in any one region's stock, management could create a truly resilient fishery. Instead, owing from management's constant exertion of greater & greater regulatory restriction in response to catch-estimates long parted from science's demand for observable, testable averments; indeed, long parted from Popp's test of falsifiability, we are now at a place where a simple fishery is propped-up only by relentlessly more restrictive regulation. Where does the buck stop? Who has the ability to put a stop to recreational regulation based primarily from the centerpoint of incredibly broad catch estimates? Stop the pain. Turn U.S. Fisheries toward science-based restoration & away from misusing estimates. The recreational black sea bass fishery has been under constant assault from bad catch estimates for the last several years. NOAA & NMFS were supposed to repair recreational catch estimating methods and claims to have done so; yet the estimates grow worse – would be laughable were they not so painful. Under the guise of “best available science” these estimates camouflage the true ills of our temperate reef fishery. At the problem’s core is using a statistical spread incorrectly. Because the true and correct answer to “How Many Fish Did They Catch” is anywhere in a broad statistical spread, yet managers will use only the centerpoint; compliance with fish quota regulation becomes not a matter of fact, but a wild & random guess. Once ‘overfishing’ or ‘overquota’ has been asserted by the estimating system, managers have no choice but to further restrict catch. We know our fishery. This specific problem is MRIP’s assertion NY private boats caught 21.6 times what the party/charter skippers landed. Yet fishers are more inclined to believe private boats would have landed fewer sea bass..
Use of bad estimates is destroying the recreational sea bass fishery & doing so with no benefit to the fish. This situation is far deeper than a simple letter can detail. It will absolutely require a firm hand from the highest of levels.